The founders of HuePhoria LLC thought they had a winning business model, selling their colorfully hand-painted party glassware to upscale gift boutiques. Just a few years after its 2005 launch, the company had built a wholesale channel of about 1,800 stores nationwide. But when the U.S. economy fractured in 2008, so did sales for this microbusiness. Consumer spending shriveled and upscale gift stores that bought products like HuePhoria's cut inventory drastically. "The stores started getting really nervous, and products like ours" (weren't attractive anymore), says co-founder Lisa Assenza, who oversees the Syracuse, N.Y.-based company's advertising and graphic design. Things started looking really bleak by mid-2008. 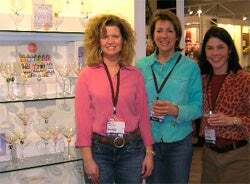 HuePhoria co-founders -- Assenza, Jen Falso, and Kathy Berger -- had been attending about four gift shows a year in New York and Atlanta to reach prospective buyers. Each show cost the four-employee company about $10,000, between travel expenses, product samples, as well as registration, booth and sales rep fees. In previous years, the shows paid off through dozens of new store orders. But nervous retailers either stopped attending or weren't as interested in their products. "We started to realize that the formula for this company just wasn't working,” says Berger, who handles the company's sales and marketing. "It became clear we were on a fast track to the poorhouse." Late 2008 brought more pain. Nearly 40% of the independent retailers HuePhoria sold to were struggling financially, Berger estimates, and some had filed for bankruptcy. So, they decided to focus more on selling through HuePhoria's Web site rather than wholesale to retailers. In early 2009, the company also hired a search-engine optimization consulting firm at a cost of $1,200 a month for seven months to help drive traffic to the site. While the firm did deliver more eyeballs, they didn't translate into paying customers, Berger says. By year's end, revenues for 2009 plummeted 40% from the previous year to total $154,000 -- and continued to slip in early 2010. The trio decided they needed a business coach to help them refocus. Assenza had a family connection to Ann Hofferberth, a former executive at FTD Inc. and Hallmark who had started a coaching business based in Panama City Beach, Fla. The partners set up a meeting with Hofferberth over Skype in mid-2010 and were immediately impressed with her understanding of the retail world and fresh ideas for expanding their business. They signed a retainer with her in October 2010, in a consulting relationship that continues today. • How can you reach new customers more cost effectively and use their enthusiasm to sell our product? • Where might it make sense to hire someone to help you fix your business? • What kind of outside expertise might the company need to take it to the next level? Hofferberth recommended that HuePhoria add a greater variety of party-ware products to its Web site by forging relationships with drop-shippers, other manufacturers and retailers willing to manage the inventory and ship product on-demand. It was a way to expand product offerings without the hassle and expense of housing the inventory. Then Hofferberth looked for ways to capitalize on HuePhoria's loyal customer base of moms. Having seen the success of direct-sales companies like Pampered Chef in which women sell products during parties they throw for their friends, she suggested this model for HuePhoria. "I saw that they had all of this enthusiasm around their product," Hofferberth says. "It made sense that they use that enthusiasm to get other people to sell their products." In November 2010, HuePhoria launched its "Ball Mom" program, which offers women start-up kits for $150 to $599 so they can host parties and sell HuePhoria products for a 25% cut of all sales. The founders of HuePhoria pictured with their hand-painted party glassware. HuePhoria currently has eight direct sales reps, including some long-time customers, and recruits through ads on Craigslist. Ball Moms now account for 44% of HuePhoria's revenues, while drop-shipping accounts for 35% and third party retail sales only 19%. The new strategies are paying off. Sales in the first quarter of 2011 are up 72%, compared with the same period last year. The company is on track earn $300,000 in annual revenues in 2011, which would mark the small company's best year yet. Lesson Learned: The co-founders credit their improving financials to their willingness to try a new business model when the old one wasn't working. Berger says they also will continue to work with their business coach and be open to more outside expertise: "Our biggest lesson is we have to never be afraid of asking people for help."